More than half of in-state students who applied were accepted at the UW in a “historically diverse” freshman class. 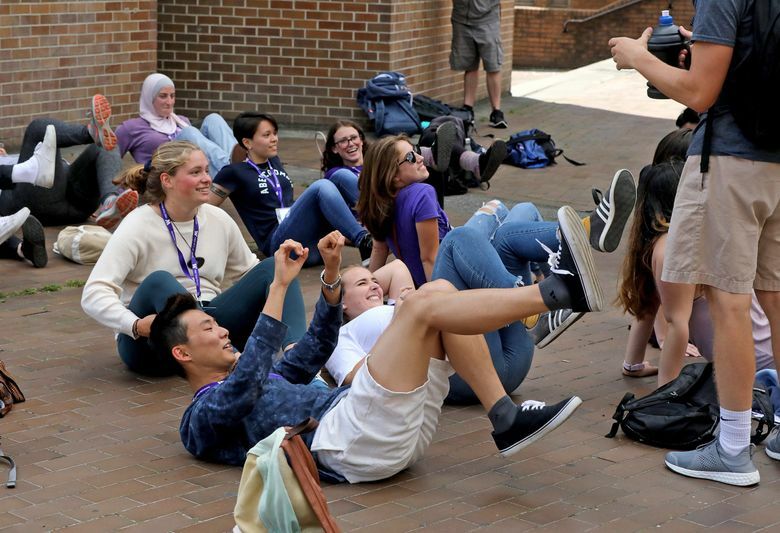 The University of Washington will welcome the largest freshman class in the university’s history on two of its three campuses, driven in large part by a record-setting number of in-state and out-of-state students who applied last fall, and then accepted an offer of admission. That growth is running counter to a national trend. Across the country, the number of students pursing a bachelor’s degree has been on the decline in recent years, although most of Washington’s public colleges and universities have seen slight upticks in growth. 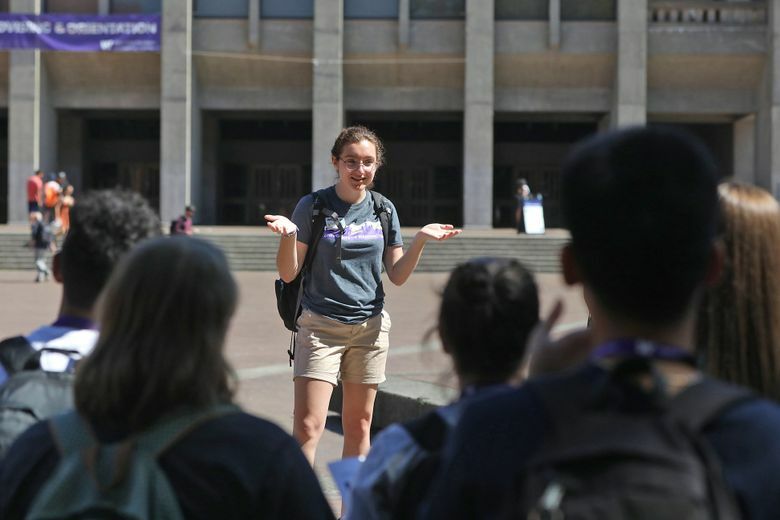 On the Seattle campus, about 4,450 of the freshmen, or 63 percent, will be Washington residents. 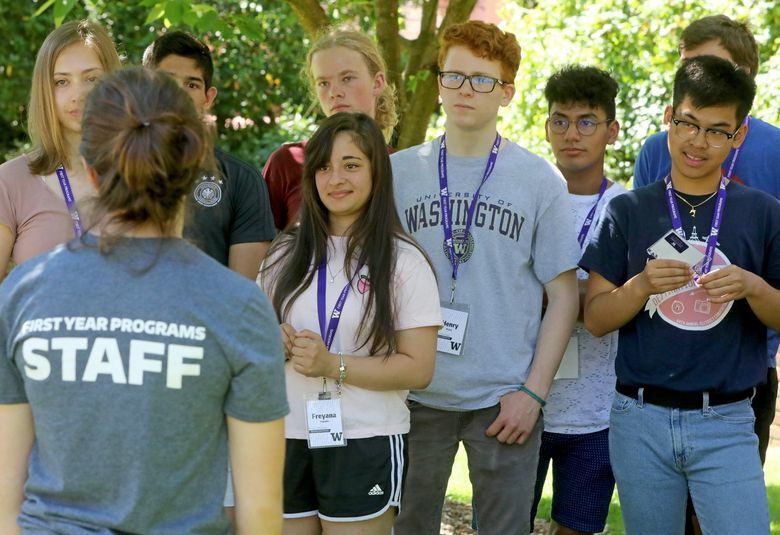 They make up a smaller percentage of the class because the class itself is so large — five years ago, in 2014, Washington residents made up 67 percent of the freshman class. At the main campus, a little more than 54 percent of in-state students who applied were admitted this spring. That’s lower than in previous years, when the number was closer to 60 percent, and it’s because of the “unusually robust growth” in applications from Washington residents, Ballinger said. The UW received 13,108 applications from in-state students — an increase of nearly 6 percent from the previous year. There’s a common misconception that the UW admits as few as 5 or 10 percent of in-state students who apply, UW President Ana Mari Cauce told the UW Regents during a meeting Thursday. The reality, she said, is that more than half get in. This also marked the first year that the UW began admitting students directly into its College of Engineering. 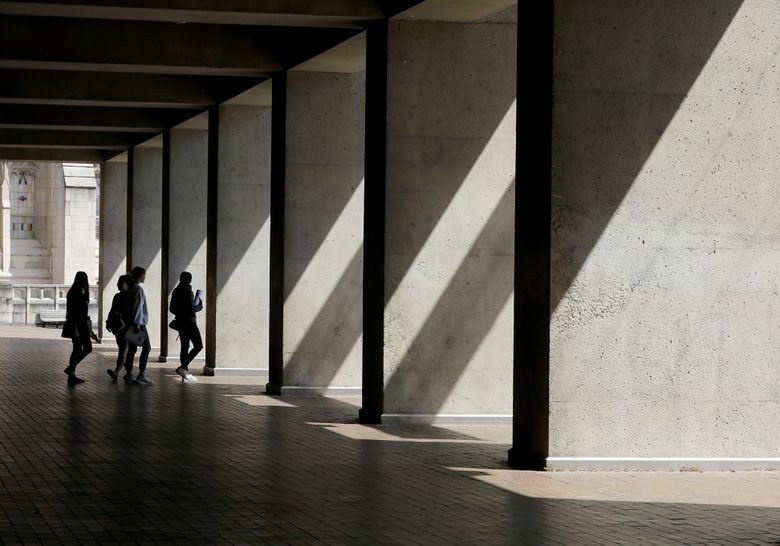 Before this year, students who were admitted as freshmen had to apply to the engineering school after their first or second year, and about half were turned away because engineering is so popular. The admission change significantly boosted the “yield” — the number of students who said yes to an offer of admission — among students who wanted to go into engineering, Ballinger said. That was true for Matt Cotter, an incoming freshman from Spokane. He was one of hundreds of students on campus this week for freshman orientation. Cotter said he applied and was accepted to a number of colleges, but “UW was the best offer of all of them.” He also was accepted into the honors college and received a scholarship. “I love Seattle, I love how much you have to do here,” he said. “It’s a really cool place to be.” Cotter said he liked the city’s open sense of community and its large and vibrant queer population. Dalton Lee, an incoming freshman from Oregon, said the UW seemed like a good deal compared to Tufts University, one of the other schools where he was admitted. Tuition, fees and living expenses at the private Massachusetts university run about $72,000 a year. (UW Seattle projects out-of-state students will pay $53,329 in tuition, fees and living expenses in 2018-19.) Lee was also directly admitted into engineering and the honors college, although he’s thinking of switching to computer science. Next year, the direct-to-major admission policy will be extended to computer science majors. Despite concerns that the number of international students would drop because of the Trump administration’s travel ban and its strict policy on immigrants, the UW has seen a relatively small decline in applications from foreign students in the last two years. 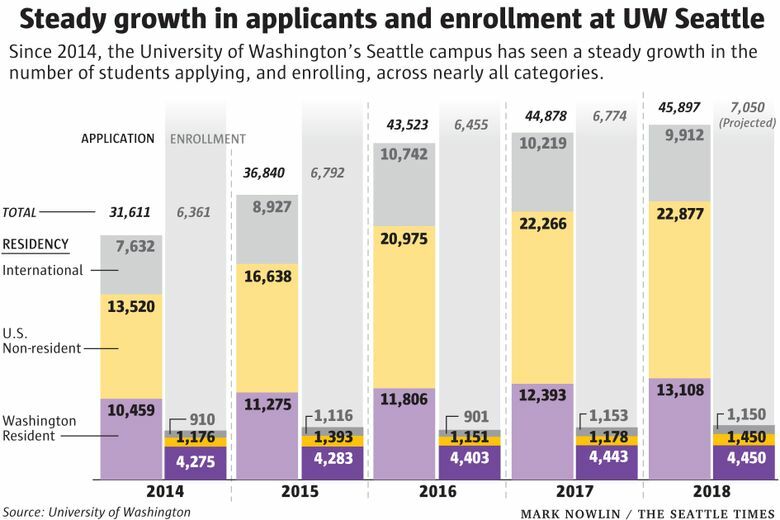 The 1,150 international students who accepted an admission offer to the Seattle campus is almost identical to the number who came to the UW as freshmen last year. The Seattle campus also expects to enroll 1,500 transfer students this fall, about 87 percent of whom will come from the state’s community and technical colleges. 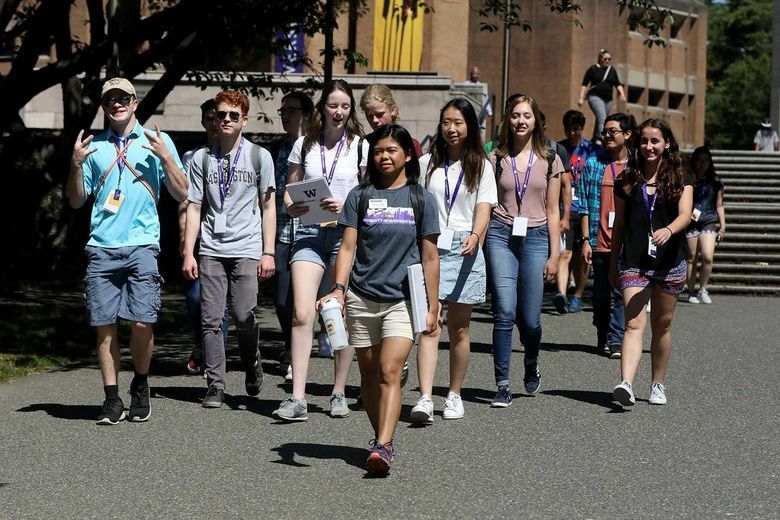 The UW’s Tacoma branch campuses also expects a record-setting number of freshmen, but UW Bothell is on target for a slightly smaller freshman class, said Steve Syverson, assistant vice chancellor for enrollment management at Bothell. The decision to slow down growth in Bothell was because the campus is nearly out of space, he said. UW Bothell expects to enroll 831 freshmen, and UW Tacoma projects 702 freshmen. For both campuses, in-state students make up about 93 percent of the class. The average standardized test scores for admitted students at UW Seattle are nudging upward. But Ballinger cautioned that parents and students shouldn’t read too much into those numbers, because “average” is not the same as an admission cutoff or requirement. Given that caveat, here are those numbers: The average SAT math score for an incoming freshman to the Seattle campus in 2018 was 685. According to the College Board, which administers the test, a student who scored 680 in 2017 — the latest year for which statistics are available — did better than 91 percent of all students who took the test. The average reading and writing score was 644. A student who scored 640 on reading and writing in 2017 did better than 85 percent of all students who took the test. Out-of-state students who plan to enroll had a higher average SAT score overall (1384) than in-state students (1308), but lower GPAs (3.76 for out-of-state, 3.81 for in-state). Although it’s a state school, the UW draws more of its students from the Interstate 5 corridor, and its demographics reflect that mix, including a higher percentage of Asian-American students than the rest of the state, Ballinger said. Initiative 200, passed by Washington voters in 1998, prohibits the university from giving preferential treatment to students on the basis of race. That prevents the university from using affirmative action when making admissions decisions. Last year’s admissions season marked the first time that the UW has used a national common application, called the Coalition Application, used by more than 140 colleges and universities. Its aim is to make it easier for all students to get into college, particularly those from historically underrepresented groups. The coalition schools all offer generous financial aid or low-cost in-state tuition, and all graduate students with low debt, or none at all. The UW received more applications than any of the other coalition schools, Ballinger said. Tuition for in-state undergraduate students in 2018-19 will be $10,127. Both out-of-state and international undergraduate students will pay more than three times as much: $35,508.